Daily Language Review Warm Up and Homework for 5th Grade. 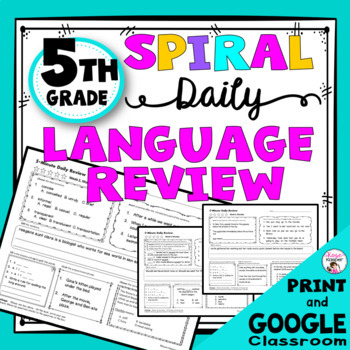 Do you wish you had a great spiral Language Arts Review / Morning Work / Warm Up Work / Homework / Test Prep resource for the entire year? This is the fifth grade version of my popular 4th and 3rd grade Daily Language Reviews that are currently in use in almost 2,000 classrooms. To view ratings and comments about my 4th grade Daily Language Review, click here. I was always struggling to pull together resources for language arts skills needs, plus some skills that needed review from the previous year. This comprehensive Language Arts Review that does just that! This resource is a spiral review of all language arts objectives covered by 5th grade Common Core and TEKS (for Texas teachers). Also included are many 4th grade objectives that need review. One way to use this comprehensive resource is to use one sheet each day for warm-up or bell work. This should take about five minutes. Review the completed questions with your students. This may take another 5-10 minutes – time well spent, as you are spiraling through each objective many times throughout the year. On Thursday, students take their completed sheets home and study for the quiz on Friday. This is a great way to communicate to parents what is being studied at school! And parents will love you for the study guide! Each question on the quiz is a repeat of a question from during the week. If students study or remember the questions from the week, they can earn 100% on every Friday quiz! Friday’s quiz can be a weekly Language Arts grade. Another way to use this resource is for homework. Each week has a cover sheet, so you can easily copy the whole week’s packet at one time. I send a homework packet home on Monday, and it’s due on Friday. You can still give the quiz on Friday as a homework or quiz grade. 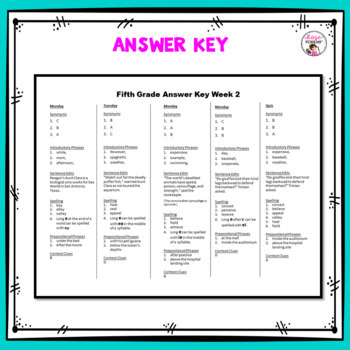 The answer keys are conveniently located at the back of the resource and clearly labeled by objective. Thus, you can easily skim through the answer key to find a particular objective you need to review. The possibilities are endless when you have such a comprehensive review as this resource. Every 5th grade objective is covered several times throughout the year. This resource contains 180 pages of student practice sheets, a cover sheet for each week (36 cover sheets), and 36 answer sheets, for a total of over 250 sheets in this comprehensive review packet. "I've been teaching for a couple of decades and have always used some type of Daily Language. This one is clearly head and shoulders above the rest. It is quite complete, has a logical-kid friendly layout, and weekly tests to boot. It covers all the standards and is WAY underpriced. Just a fantastic product. I appreciate all your hard work. It must have taken forever to put this together in such a thoughtful manner. My class will reap the benefits next school year!" I sincerely hope you will take a look at the quality of this product by downloading the free preview of this 5-Minute Language Arts Review / Bell Work / Warm Up Work / Homework package. I hope you will be as pleased with it as I am.